Recounting the long history of mistreatment experienced by Alaskan Eskimos and other indigenous peoples in this country, Curtis Ivanoff stressed that Jesus Christ is the only hope for reconciliation in the long journey of righting past wrongs, mending broken relationships, and bringing healing amidst deep pain and struggle. 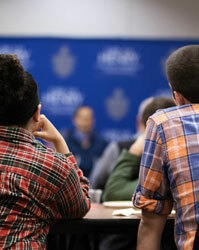 In the final installment of the Timothy Series, the Henry Center hosted Curtis Ivanoff, Field Director for the Evangelical Covenant Churches of Alaska. Having grown up in Alaska and being the grandson of an Eskimo, Curtis brought the difficult and often forgotten experiences of his people to bear on the topic of reconciliation. In his first chapel address, Curtis spoke from his own journey of trying to understand the pain experienced by his people at the hands of the US government and surprisingly, at the hands of American missionaries. After Alaska was purchased by the US in 1867, missionary efforts soon followed. Yet the indigenous Alaskans discovered that to become a Christian was to become an American. Cloaked in the message of salvation was the idea that the “savages” Alaskan Eskimos were once “far away” – literally, on the other side of the world from Jesus’ Palestine. Yet the blood of Christ has brought them near.must be “civilized” and conformed to the American expression of Christianity. Discipleship was replaced with assimilation, and the local languages, customs, and even surnames were changed in the name of America’s imperialistic brand of Christianity. The message was clear: indigenous Alaskan culture was inferior and should be fixed. It is a tragic story shared by countless other indigenous peoples victimized by overzealous settlers, often in the name of Christ. There is still much pain, bitterness, and hostility left unhealed. Decades and even centuries of reproach on the name of Christ has to be undone. And the idea that Christianity, the “white man’s religion”, decimates local peoples has to be rewired. Yet this is the hostility that the cross of Christ put to death (Ephesians 2). Alaskan Eskimos were once “far away” – literally, on the other side of the world from Jesus’ Palestine. Yet the blood of Christ has brought them near. The reconciling work of Christ now enables forgiveness and restoration. 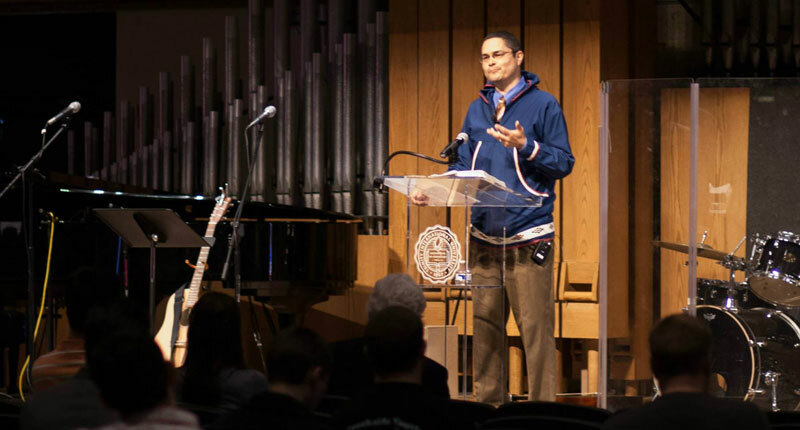 The Presbyterian Church issued an apology for assimilation efforts in the name of Christ, and indigenous churches are discovering that hope is not lost when the gospel of Christ takes center stage. In Curtis’ second message, he emphasized that reconciliation is a journey that requires tears. Restored relationships require deep pain. And true neighbors (Luke 10) are those who are willing to enter into stories of brokenness – marriages on the rocks, racial tensions, uncomfortable places – and be fully present. True neighbors offer their lives and don’t hide behind band-aid solutions. There are many social ills that plague native peoples in our country, and much of them can be traced to social injustices: discriminatory legislation, the eradication of local culture, and forced removals (one of the most tragic being the Trail of Tears). When people recognize and speak of these injustices, they are being neighbors to the native community. However, to continue making progress, people must move from being a neighbor to lamenting. To be gripped by the high cost of reconciliation is to embrace lamenting in prayer. For “reconciliation without lament cheapens hope.” Discrimination on both the individual and systemic levels still exists, and there is still much work to be done. It often feels like a hopeless effort, but lamenting like the Psalmist is the key to restoring hope. We must enter into people’s stories and lament with them, placing our ultimate hope in the reconciling power of the cross. Curtis closed by asking this poignant question: “How do we forgive our ‘Great White Father’?” It it through the gospel of Jesus Christ and his ministry of reconciliation, where his kingdom can be known here on earth.